Amanda grew up in the small town of Redwater. She graduated from the University of Alberta Dental Hygienist program in 2010. Amanda is working fulltime on Dr. Ting’s team and has spent her entire career at Southfort Dental Centre. In her spare-time, Amanda enjoys traveling the world, snowboarding, yoga, and eating delicious foods! Amanda is one of the most focused individuals. However, don’t let that make you think she doesn’t have the ability to make you feel comfortable and laugh during your cleaning! Kirsten graduated from the University of Alberta Hygiene department in 2010 and has spent her entire career at Southfort Dental Centre. She initially started working on Dr. Ting’s team before joining Dr. MacPhail in 2011. During her spare time, she loves spending time with her horses at her acreage. Kirsten has a way with Patients that makes you feel at ease in the Dental Chair. Melissa, like her sister Amanda, grew up in the small town of Redwater. She graduated from the University of Alberta in 2014. 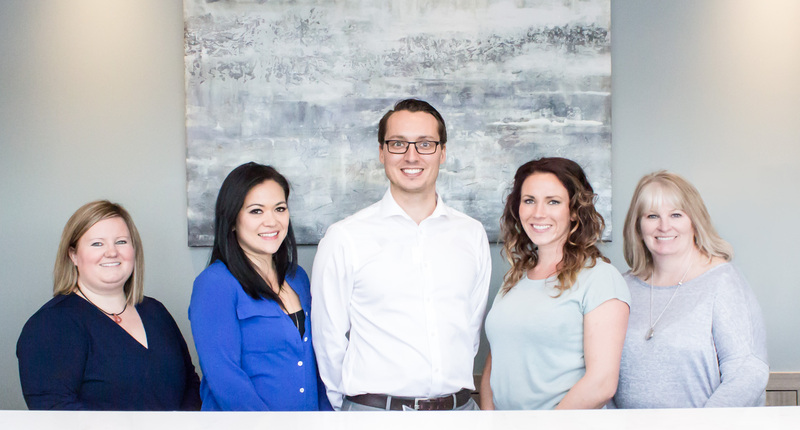 Melissa is working full-time on Dr. Ting’s team and has spent her entire career at Southfort Dental Centre. Melissa recently purchased a home with her husband in Redwater. Melissa is an excellent hygienist who has an ability to make you feel at home while getting your teeth cleaned. 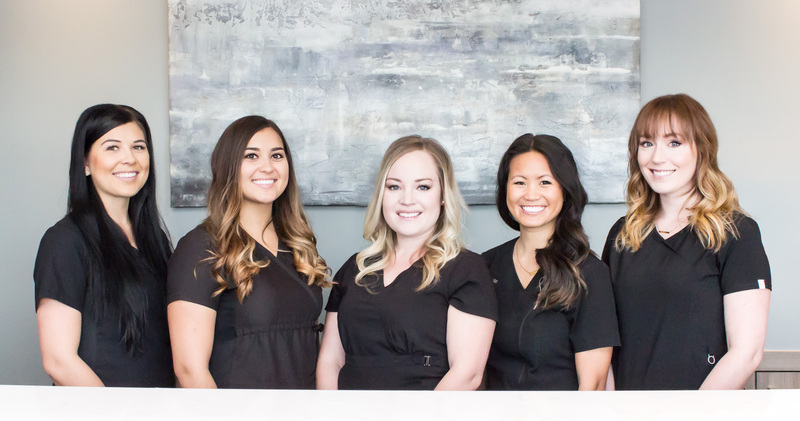 We couldn’t ask for a friendlier hygienist to join our team. Teagan graduated in 2014 from the University of Alberta Hygiene Department. She is a small town girl who decided to follow in her older sister’s footsteps, Kirsten, and become a Hygienist. 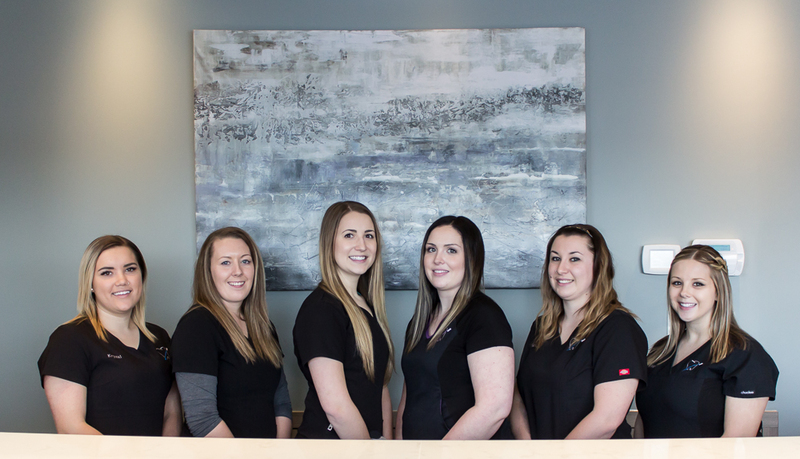 Teagan is Dr. Radisic's hygienist and has spent her entire career at Southfort Dental Centre. Teagan has recently bought a home in Fort Saskatchewan and in the summer of 2017, she will be getting married! Allison was born and raised in Fort Saskatchewan. She graduated from KDM in Aug. 2014 and has spent her entire career with Southfort Dental Centre. Allison is one of two Dental Assistant for Dr. MacPhail. If you’re lucky, you may catch Dr. MacPhail and Allison humming to songs while working on patients. Ashley grew up in Sherwood Park and graduated from KDM in 2014. She received the Top Dental Assistant award in her class. Ashley started working at Southfort Dental in 2015 and joined Dr. Ting’s team. Ashley and her fiancée just finished building their dream home in Fort Saskatchewan and we’re lucky to have her join our team. Ashley is currently working on getting her scaling module at NAIT. Southfort Dental Centre is very lucky to have Ashley join our team. She is one of the hardest working individuals, but still has a laugh that is contagious. Colby has spent her entire life in a small town. She graduated from Dental Assisting School at KDM in 2013. Colby started working at Southfort Dental in 2014 as Dr. Chin’s Dental Assistant. In the summer of 2015, she moved over to join Dr. Ting’s team. Some of Colby’s hobbies are volleyball and baseball. You will often find her in the small town slow pitch tournaments throughout the summer in Alberta. Colby has a wonderful and positive attitude. She never lets things get the better of her. Krystal graduated from KDM in March 2016 and has been with Dr. MacPhail at Southfort Dental since graduating. In her earlier, she played on the University of Lethbridge Womens Hockey Team. After a few years at the University of Lethbridge, Krystal decided to follow her dream of being a Dental Assistant. In the fall of 2016, Krystal finished her Ortho module and will help Dr. MacPhail with her Invisalign cases. We’re happy to have her join our team and also learn a few things about how the great game of Hockey should be played. Meghan is our newest member to the Southfort Dental Team. She graduated as a Dental Assistant in Oct. 2016 and joined Dr. Radisic's Team. In the fall of 2017, she will be getting married and hoping to move to the Fort Saskatchewan area in the near future. We’re happy to have Meghan join the team and she is already on her way into becoming a great Dental Assistant. Paige grew up in Sherwood Park and graduated from Nait’s Dental Assistant Program in 2013. Paige joined Southfort Dental in January 2015, where she has been working with Dr. Radisic's Team. Towards the later part of 2015, her family moved to Fort Saskatchewan. In April of 2017, Paige will be expecting her second baby girl! We’re so excited for her and her family, but will miss her friendly smile around the office. She is planning on returning to work in 2018. Deirdra is our newest team member who joined Dr. Ting’s team in July of 2016. She spent most of her Dental career in British Columbia, where she was both a Dental Assistant and Dental Receptionist. In 2013, she returned to the Dental community after raising her 2 beautiful kids. She also operated a day-home for a few years during the mid 2000’s. She currently lives in Gibbons and was excited to find a dental office so close to home. Gemma joined Southfort Dental in 2015 as Dr. MacPhail’s Receptionist. Before that, she travelled the country with her husband who was an officer in the Canadian Military. Gemma initially graduated as a Nurse in Nova Scotia before coming over to the Dental community. She graduated as a Dental Assistant in 2006 in Barrie, Ontario and eventually moved into the role of Dental Reception in 2008. We’re very happy to have Gemma join the Southfort Dental Team. Leah joined the Southfort Dental Family in October of 2016. She joins Southfort with extensive knowledge in accounting and business. Leah is from Peace River, but now lives in the Fort Saskatchewan area with her husband and two beautiful daughters! We’re lucky to have Leah join our family and we know she is looking forward to meeting all of Dr. Radisic's patients.